The cereal leaf beetle can be a problematic pest in cereal. Cereal leaf beetles (CLB) overwinter and emerge in the spring, where they can move into winter and then spring wheat. Larvae and adults can do significant damage to crops. 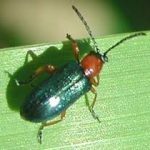 Biological control has been particularly effective in reducing cereal leaf beetle populations. CLB larvae and adults feed between the veins of the newest leaves on host plants. Larvae cause the most damage by removing long strips of tissue from the upper leaf surface, while leaving the translucent cuticle of the lower surface intact. This feeding pattern produces a characteristic “frosted” appearance. Tips of damaged leaves frequently turn white, giving heavily infested fields a frost-damaged appearance. Adults will chew completely through the leaf, which results in narrow slits, although the damage they cause is usually insignificant. Yield losses of 25% have been reported in irrigated spring wheat in Washington State. 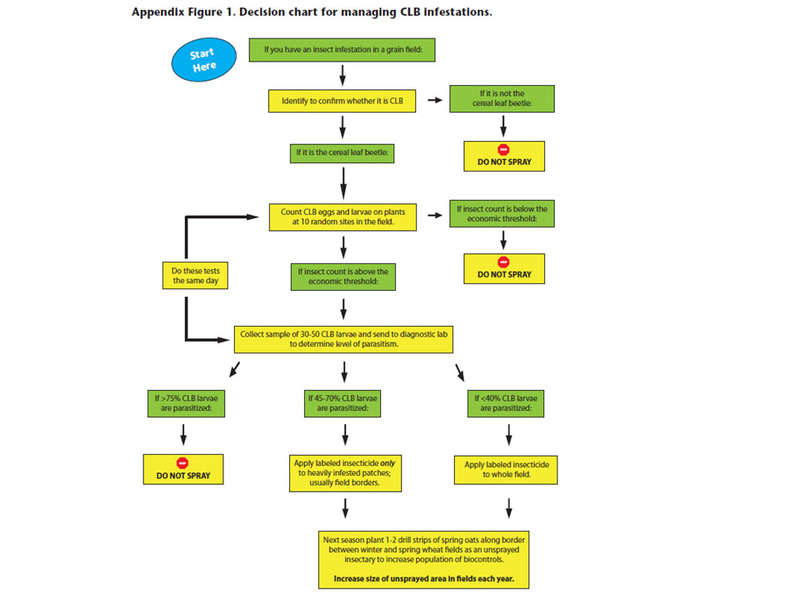 Yield loss is influenced by crop vigor and the timing and duration of the CLB infestation. Stressed growing conditions or poorly developed plants may increase potential damage. The parasitoid wasp Tetrastichus julis provides effective control of the CLB. This biocontrol agent has established itself successfully in many areas of the PNW. T. julis parasitoid wasps are very small (1/8 inch) and produce two generations per year, which are timed with CLB larvae occurrence in the field. The female wasp inserts its eggs into a CLB larva, where several young can complete their development. 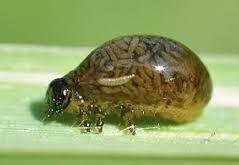 Upon hatching, the parasitoid larvae feed within the CLB larva and destroy it during pupation in the soil. Although current season CLB control does not occur since CLB larvae continue to feed until pupation, CLB adults emerging in the summer and the following spring are reduced due to the parasitoid wasp. Integrated management of CLB involves multiple decisions (click on Flowchart below) Insecticide applications target CLB larvae, and the optimal time to treat is when small larvae are present on foliage. However, the parasitoid T. julis has kept this pest at low levels and treatment for CLB as a pest has rarely been needed in the last 10 years.